Employability: Job Ready is the second stage of Yooralla’s Employability program, and focuses on building your job skills to support your pathway to employment. Employability: Job Ready is one year of paid, on-the-job training based in a Yooralla Business Enterprise or in the community. Employability: Job Ready is for people who have completed Employability: Preparation for work, or people who already have some job skills and require less support. In Employability: Job Ready, you will get hands-on work experience in a real-life working environment, and you will be paid a training wage for the work you do. Employability: Job Ready is specially designed for people with disability who have vocational/employment related goals, an interest in working, and some basic work skills. Yooralla can tailor a job skills program to suit your individual needs and capabilities and support you to help you transition into the employment that is right for you. The Employability Stream, Job Ready, is focused on helping you learn job skills on-the-job, to help you to transition into employment after the program. You will experience a hands-on learning environment in a community-based, real-life work setting and you will be with people of a similar age, with similar interests. Assessments will be based on your competency in the above areas, as demonstrated on-the-job. Your progress will be monitored throughout the program, to ensure you are reaching your milestones. 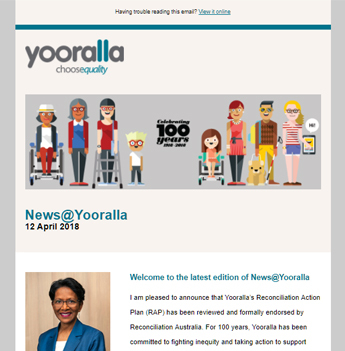 Work in the Employability: Job Ready program may be in the community or in a Yooralla Business Enterprise. Yooralla has Business Enterprises in metropolitan Melbourne, Shepparton/Mooroopna and in the Hume Region, where you can gain rewarding experience in a range of areas to suit your needs and interests. After completing Employability: Job Ready, you will have reached the end of Yooralla’s Employability Program.